ITER is a major nuclear fusion experimental plant, first of a kind, involving seven domestic agencies that are China, EU, India, Japan, Korea, Russia and the USA. The overall programmatic objective is to demonstrate the scientific and technological feasibility of fusion energy for peaceful purposes. At the end of construction, it will be the world's largest tokamak, a magnetic fusion device. Load test passed: Hybrid power plant in the Galapagos runs on jatropha oil. Starting in the end of 2018, a hybrid power plant will supply the Galapagos island of Isabela with electricity largely generated from renewable energy. A PV system and diesel generators running on pure jatropha oil take over this task. The vegetable oil is harvested and produced in Manabí on Ecuador’s mainland and extracted from ripe nuts of the jatropha curcas plant. This biofuel is an integral part of the “Zero Fossil Fuels in Galapagos” initiative. Ecuador’s Government started the initiative in 2008 with the aim of replacing fossil fuels in the Galapagos by 2020. The project has now taken another big step toward commercial operation, as the thermal part of the station has now successfully passed its load test. On 28 September 2018, Lahmeyer, a company of Tractebel, handed over the provisional acceptance inspection certificate for this part of the power plant to the contractor, Siemens. After completion of the EPC work it is expected that Siemens will receive the acceptance inspection certificate for the entire hybrid power plant by the end of the year. After this, the 24-month guarantee period for the plant begins. 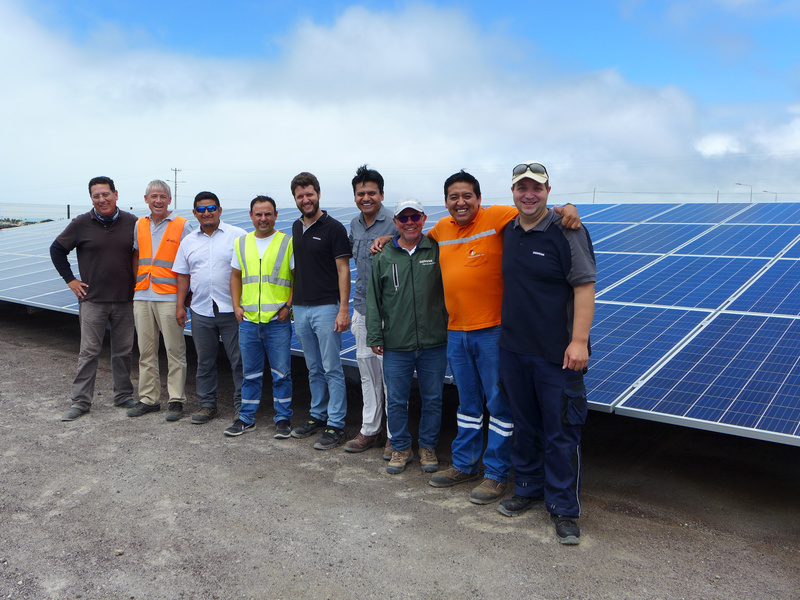 Following comprehensive training, the staff of Galapagos power supplier Elecgalapagos (EEPG) took over responsibility of running the station in October. Experts from Siemens are providing the staff with support. Lahmeyer provides owner's engineer services to the Ministry of Energy in Ecuador for this project. The German development bank KfW provided the majority of the finance for the project in the form of a subsidy. The hybrid power plant in Isabela has five units total with a combined output of 1,625 kW. These are in addition to a 950 kWp photovoltaic plant and a 660 kW/333 kWh lithium-ion energy storage facility. This makes it possible to operate in diesel-off mode when the Sun shines, in order to reduce the fuel consumption of the plant. The units are run on pure jatropha oil, with diesel fuel as back-up fuel. The staff of EEPG, Siemens and Lahmeyer International are on the home stretch.